RBTH spoke to historians to know more about the elegant mansion, which was built at the turn of the 20th century and has been the residence of the Australian Ambassador in Moscow since 1959. For more than half a century, a mansion in Kropotkinsky Pereulok has been the official residence of the Australian Ambassador in Moscow. 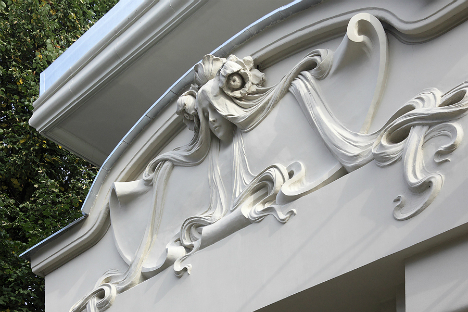 RBTH spoke to art historians to know more about the history of this art nouveau building. The first owner of the mansion was Alexandra Derozhinskaya (née Butikova), the only heiress to a large textile business called the Ivan Butikov Association of Manufacturing Works. She bought the land in Kropotkinsky Pereulok in 1901. To design the house, Derozhinskaya invited Russian art nouveau architect Fyodor Schechtel, who specialized in mansions for the Moscow elite. Schechtel designed the building and its interiors. The doors, furniture, floor lamps, lighting fixtures and bronze fittings were all made from his drawings. In 1903, the mansion was completed. “All the main reception rooms on the ground floor are grouped around the central hall, which the architect believed is the heart of the mansion,” says Lyudmila Saygina, art historian and author of the book ‘Architect Fyodor Schechtel. Encyclopedia of Creations. The drawing room, the dining hall, the library, the master bedrooms and offices were all on the ground floor. From the central hall, one could reach the master’s office and the landing of the grand staircase, beyond which there was the door to the mistress’s quarters. A winding staircase from the dining room was intended for the domestic staff, whose bedrooms, together with the nurseries and teachers’ rooms were situated on the first floor. Although nurseries and schoolrooms occupied most of the first floor the Derozhinskys did not have children. For an early 20th century building, this mansion could boast all the latest technologies of the time. It had steam heating, exhaust ventilation, sewerage, running water, electricity and even a telephone. However, they remained in Moscow and had to work as hired labor. “Sergey and Alexandra make two rubles a day doing various odd jobs and are happy to have even that,” Sergey Zimin, the brother of Alexandra’s third husband, wrote in his diaries. After 1917, the house was occupied by various Soviet government departments. In 1959, it became the residence of Australian Ambassador in Moscow.